Another excellent video by the folks from the Common Craft. Enjoy! If you are a designer, developer, information architect, project manager, writer, editor, marketer, or someone who just deals with Web sites, then you are invited to participate in “The Survey, 2008” by A List Apart. You can see the analysis for last year‘s survey. Creative Commons Singapore is Coming! Just saw an announcement that the draft CC Singapore license has been put for public discussion on my feedreader from Creative Commons blog. So, do go over to CC Singapore to join in the discussion. CC Singapore is hosted by the Centre for Asia Pacific Technology Law & Policy (CAPTEL) and is lead by Anil Samtani and Giorgos Cheliotis. The launch event is planned for 27 July 2008 with the completed licensing suite. 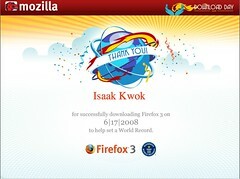 Really looking forward to the release of Mozilla Firefox 3 on 17 June 2008 (18 June in Singapore). Have been using the betas of Firefox 3 (the latest is Release Candidate 3) for the past couple of months and it has been a pleasure to use. The previous version had problems with high memory usage and frequent crashes. But all such problems have eliminated or reduced. So, remember to click on the logo above and pledge that you’ll download Mozilla Firefox 3 on the launch day! UPDATE: Had fun playing around with the new version of Firefox 3. Anyway, if you have downloaded, you can go print your own certificate for participating in the download. Ever wondered what’s the craze over social media is all about? Common Craft has created yet another wonderful video explaining what social media is and how anyone can be a producer of content. 1st May has been designated as RSS Awareness Day. And they have a website set up at RSSday.org. Or you can read more about RSS Awareness Day at Daily Blog Tips. So, remember to promote RSS on 1st May. Common Craft Show has just come out with another great video on explaining social media. This time it’s on podcasting. Over the past few days, FriendFeed has grown in popularity amongst the A-List bloggers. Basically, what FriendFeed does is to aggregate all the different entities I have online such as Twitter, Facebook, Flickr, Zooomr, Google Reader, de.licio.us, and this website into one giant feed. If you want, you can always add me as a friend here. This is absolutely one of the funniest video I’ve seen in a while. Remember to blast your speakers as you watch the video. A comprehensive listing of some of the more interesting online word processors available. I’ve personally used Google Docs, Buzzword and Writeboard. The mainstay for me is Google Docs because of its integration with the rest of the Google apps. However, I must say I’m very impressed with the UI design of Buzzword, which makes use of Adobe AIR. An update to their original article “Blogs Will Change Your Business” in 2005. Very informative, particularly if you are quite new to the idea of social media. Interesting article on Wikipedia, Digg and other Web 2.0 entities on Slate. A presentation done by Richard MacManus of ReadWriteWeb at the Media08 conference in Syndey.